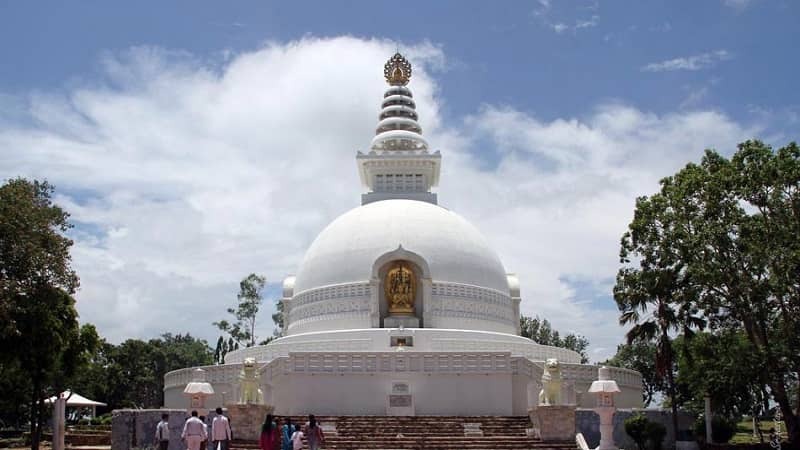 The serene ambience of Rajgir was perhaps the favorite grounds of Lord Buddha for he delivered many of his sermons at Rajgir, the then-capital of Magadha Empire, and frequented its premises often whilst he was a spiritual Teacher. Magadha, one of the ancient Indian Kingdoms (Mahajanapadas), had its capital at Rajgir before its ruler Udayin shifted it to Pataliputra (modern day Patna). Rajgir’s earlier name was Rajgriha. Rajgir could translate to ‘abode of kings’, ‘royal house’ or even ‘Royal Mountain’. The city was also known by the name of Girivraj. The date of its precise origins has not yet been ascertained, although archeological relics from as old as 1000 BC have been unearthed from its precincts. The city of Rajgir in Nalanda district forms an important pilgrimage destination in not just Buddhist pilgrimage circuits in India, but also those of Jains’. The city has also been mentioned in Hindu Puranic texts like Mahabharata, making it a significant Hindu pilgrim site as well. Ancient stone walls lining the five semiarid rocky hills that encapsulate Rajgir remain as vestiges of its having once been the headquarters of Magadha empire. Since many historically important sites are strewn across its terrains, history enthusiasts would find it hard to contain their exploration of its premises to a single day. Explore the green, rural premises of Rajgir by its characteristic tonga rides. If you plan to make trips to Rajgir during November-December, try including the famous Rajgir Mahotsav, a three day cultural celebration of Indian Classical and folk art forms, in your itinerary. Vishwa Shanti Stupa – The 40 m white Stupa constructed atop 400 m elevation of Ratnagiri hill is the chief of its attractions. The Japanese-built Stupa is a symbol of the evocation for world peace. The beautiful depictions of Lord Buddha’s life stages – birth, enlightenment, preaching (Spiritual Teaching) and death- through the golden statues in the Stupa are noteworthy. You can ascend to its summit by a chairlift and enjoy the beautiful views of the surrounding hills and the landscape. Also, make sure you pay visit to the adjacently built peace pagoda for its rhythmic cadence of meditative music is sure to invite you deeper into spiritual realms. Gridhakuta (Vulture Hill) – The beloved site of Lord Buddha. The mountain at which ‘sermons on the Mount’, of which ‘Lotus Sutra’ forms an integral part was delivered precisely here. The rock outcrop at which the great spiritual being preached some of the greatest Buddhist sutras is a much sought-ought pilgrim destination by Buddhists. These include the famous Heart Sutra, Lotus Sutra and Surangama Samadhi Sutra. One comes across dilapidated remnants of a 1500 year old Stupa, prayer flags and a small Buddhist Temple here. It is also where King Bimbisara was proselytized by Lord Buddha. A ropeway would take you to the zenith of Gridhakuta (Vulture Hill) within minutes. The holiness of the site is expounded in Chapter 16 of Buddha’s Lotus sutra. The verses praise the land as the divine soil that would survive even the end of eons and as the Buddha’s own pure land blessed by divine beings. 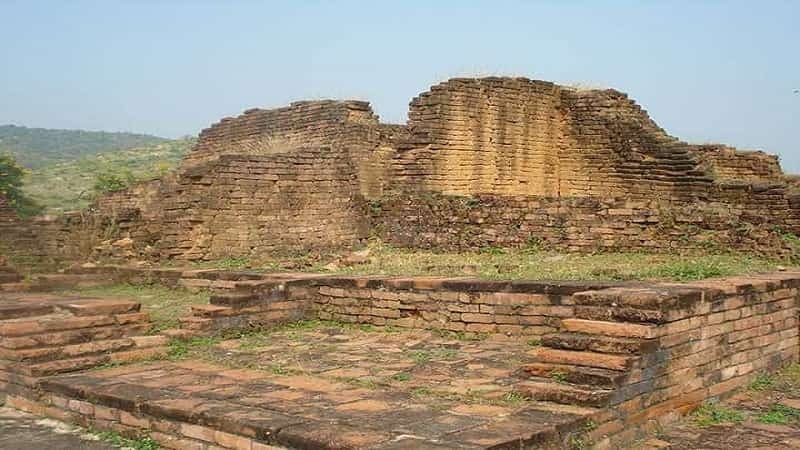 Venu van – Probably the site of world’s first Buddhist monastery. The blessed soil to have been frequented by Lord Buddha for his meditations is sure to enchant you. The beautiful bamboo gardens were offered to Lord Buddha by his ardent disciple King Bimbisara. The Karandak Nivap tank remains as the sole remnant of those times. Saptaparni Caves – Another site in Rajgir which is blessed to have once been Lord Buddha’s meditation grounds. World’s first Buddhist council was held here, six months after Lord Buddha’s Parinirvana. Hot springs – Located at the foot of Vaibhav Hill, the hot springs are known for their curative properties. The most famous of these is the Brahma kund, whose temperature is around 45 degree Celsius. The water in these springs is from the seven streams collectively known as Saptdhara, which originate from behind Saptparni caves. A 1000-step ascent from the hot springs would take one up till Saptaparni caves. Pippala Cave – This natural cave above Vaibhav Hills are situated above the hot springs described before. The cave is said to have served as a watchtower in the earlier times, and later became a holy resort of Buddhist monks. Karanda Tank: Said to have been used by Lord Buddha to take baths while at Rajgir, the tank’s remains still give a glimpse of its structural exquisiteness under Maurya Kings. Lakshmi Narayan Temple – This beautiful temple devoted to Lord Vishnu and his consort Goddess Lakshmi is situated beside the hot springs. Ajatshatru’s Fort: The ruins of the sixth century BC fort built by ajatashatru forms another historical site of the city. Some names the city of Rajgir is known in ancient references include Vasumati, Girivraja, Rajgriha, Kusagrapura and Barhdrathpura. One of its earliest known references is found in Ramayana, of its having been founded by King Vasu, Lord Brahma’s son. Rajgir also finds its mention in Mahabharata, as per which King Jarasandha ruled over its kingdom. Sri Krishna fled the battle ground whilst he was fighting King Jarasandha the 18th time, after he defeated him in prior 17 battles, which earned him the name ‘Ranchorh’. Also, the city’s premises contain ‘Jarasandh ka Akhara’, the site of fight between Jarasandha and Bhim in which the king was ultimately killed. The infamous instance of King Bimbisara being imprisoned by his own son Ajatashatru took place at Rajgir. In fact, Bimbisar’s Jail is a marked tourist destination today. They belonged to Haryanka dynasty which ruled over Magadh in the fifth century BCE, during Buddha’s lifetime. Whilst Rajgir served as the capital of Magadh, it was known for being an acclaimed centre of intellectual and religious activity. 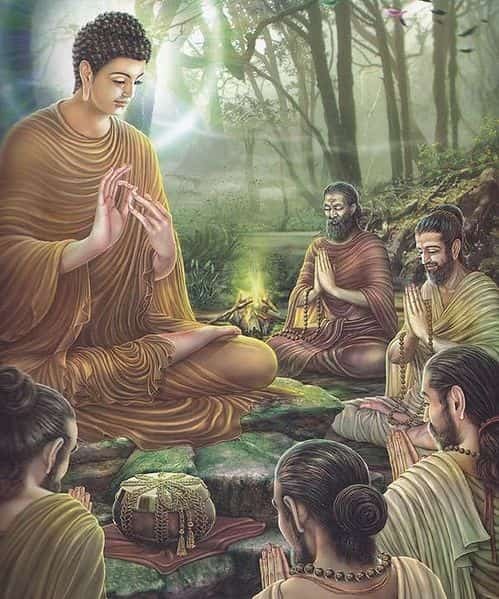 Its sacred soil witnessed groundbreaking discourses of Lord Buddha. Also, the land was the chosen site by 24th Jain Tirthankara as well. The miraculous event of Buddha subduing an angry elephant just by the virtue of his ‘metta’, loving kindness, occurred at the very premises of Rajgir. Devadatta, Buddha’s own cousin, was extremely envious of him and plotted to have him killed by letting loose an angry elephant. The intoxicated animal was about to trample a child at its feet when Buddha calmed it by touching its forehead. The animal soon prostrated before the great Spiritual Teacher and showed its reverence. References of Rajgir abound in Jain and Buddhist scriptures. It is to be noted that the holy city is equally revered by Jains as well. The 24th Jain Tirthankara Lord Mahavira is said to have spent fourteen crucial years of his life at the very city. It is also revered as the birthplace of Munisuvrat, the 20th Jain Tirthankara. The 1200 year old temple dedicated to Munisvruta is one amongst the many Jain temples within and around Rajgir. Another important Jain pilgrimage site is Son Bhandar caves. They supposedly belong to third or fourth century AD. Earlier mistaken as Buddhist sacred sites, the caves are significant to Digambar sect of Jains. Also, there are over 26 Jain Temples situated around the hills of Rajgir. Reaching them can prove quite difficult for the untrained, but if you are seeking a strenuous trekking experience, a pilgrimage to them can prove quite ideal. By Air: For domestic travelers, Patna Airport would prove the nearest. Though, the nearest international airport is at Kolkata. By Rail: Rajgir’s railway station has daily trains connecting Patna, Delhi and Kolkata. By Road: The city is well connected by road to all nearby major cities like Nalanda, Rajgir, Bodhgaya and Gaya.